A five-year-old girl has been reunited with a beloved mouse toy days after she lost it at an airport. Rosie Everett misplaced Miss Mouse after a flight from Poland to Stansted Airport on 26 February. 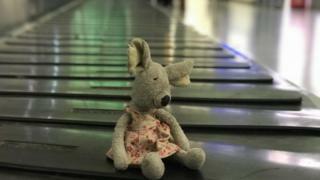 Her father appealed on social media for the stuffed animal's safe return and workers at Stansted found Miss Mouse "going round and round the luggage carousel all by herself". The toy has now been returned to the family's Manchester home. Sam Everett said his daughter was devastated when she could not find Miss Mouse. "We were getting in the car at the airport when she realised the toy was gone," he said. "We were convinced it must be in one of the bags but when we got back home Miss Mouse was nowhere to be seen. "We didn't know if it had been lost on the plane or at the airport, so we tweeted Stansted and Ryanair." Shortly afterwards, the airport posted a photo of the toy in the baggage claim area. Rosie drew a picture in which she said "thank you to everyone at Stansted Airport for looking after Miss Mouse". Daria Piotrowicz from London Stansted said: "We know it can be heart-breaking for any child to lose a much-loved and cherished cuddly friend so we are delighted we have been able to help reunite Rosie with her Miss Mouse."